Goji Berry is a woody, deciduous perennial known for its hearty, bright orange-red berries. 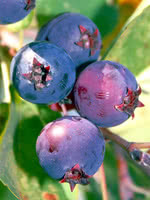 It typically produces light lavender flowers from June through September, with fruit maturation taking place between August and October. Goji Berry berries are delicious, nutrient rich, high in antioxidants, and are often called a super fruit. Many describe their flavour as being like a tart cherry tomato. 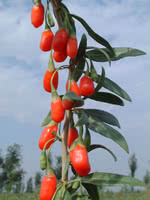 Goji Berry has a very unusual growth habit where it is somewhat like a vine, but also very much a tree. Many growers remark on its unusual and attractive qualities.